Everyone who plays a guitar learns how to strum, which is simply playing multiple strings with one downward or upward movement. Although this seems like a simple movement, it takes time for a beginner to learn. The upstroke is especially hard because of how the hand wants to move. 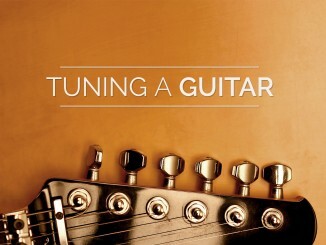 Beginners often struggle with playing all the strings cleanly. Later, they struggle with strumming only some strings. This takes some time. If you are having strumming problems, my first tip is to use thin picks. The extra flex helps you strum through all the strings. Watch how your pick is going through the strings. With your upstrokes, make sure your pick is angled to allow it to strum through the strings. Sometimes beginners have it angled to resist the strings too much. You may need to rotate your wrist as you strum. Your pick should be firmly held. Don’t let it get too loose, and don’t grip it too tightly. The best guitarists have a relaxed hand that firmly grips the pick. Practice downstrokes with a metronome for timing. Change chords each measure. Practice upstrokes in a similar way. Practice alternating downstrokes and upstrokes. Practice chords that don’t use all the strings. I often start beginners by playing A major and D major. Downstrokes and upstrokes are sometimes provided on a piece of music. When strumming quarter notes, use a downstroke by strumming toward the floor on each beat. This is usually done when you tap your foot to the beat of the music. When playing eighth notes, alternate downstrokes with upstrokes. Play the downstrokes when you tap your foot. The upstrokes should be played when your foot is half-way between taps. This means you play downstrokes on the beat and upstrokes on the “and” of each beat. Sixteenth notes are played by alternating downstrokes with upstrokes, but they are played twice as fast as eighth notes. Downstrokes are played on the beat and the “ands” of the beats. Upstrokes are played on the “e” and “a” parts of the beat. When mixing rhythms use the following two rules. Alternate between downstrokes and upstrokes for notes that are less than a beat (eighth, sixteenth, etc.) . If you’re a beginner, you’ll start by playing every note with a down stroke. This is normal, but soon you’ll want to play faster. Alternate picking is one of the most efficient ways to play fast because you alternate between plucking down and plucking up. This is a multi-octave C Minor Pentatonic Scale. In this example, downstrokes are played on all the downbeats. In this example, the downbeats correspond to the notes played on the 8th fret. In this example, you will play one octave of the C Minor Scale in the eighth position. Three notes are played per string, which will increase the difficulty. This example is more technical than the other examples because it skips strings. 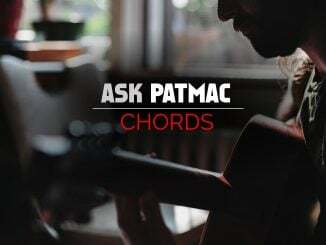 This is a must-know rock riff. If you’re just learning to alternate pick practice this slowly (40 bpm). Gradually increase the speed until you can play it at 120 bpm. This song is usually played tuned down a half step. 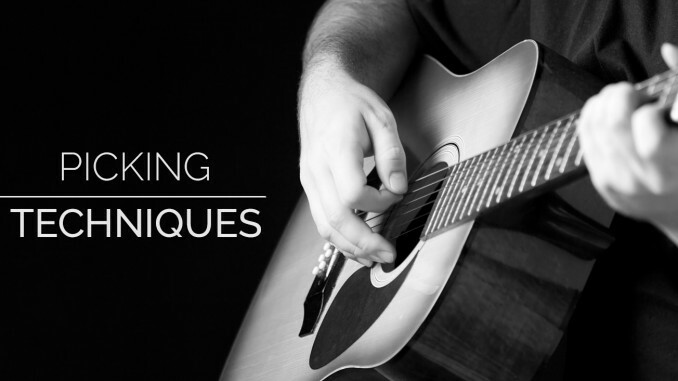 Sweep picking is a great way to play a flurry of notes quickly. It is done by sweeping your pick downward or upward and muting each individual note after it is played so that each can be heard individually. It is very important to sweep your picking hand with a constant motion so the notes are evenly played. With the fretting hand, it is equally important that you roll your fingers to mute them after each note is played. This creates the separation between notes that distinguishes it from a chord. You never want two notes to ring at the same time. If you are attempting to sweep pick with a barred finger, straighten it until it becomes rounded. This rounded shape will help you execute sweeps. I included an exercise that gradually increases speed one a three-note chord. Try to play with the example, then try different fingerings and more strings.